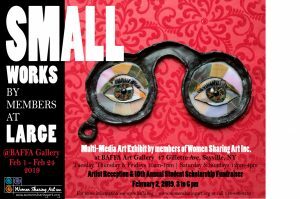 Women Sharing Art Inc. is proud to present Small Works by Members at Large, a multi-media art exhibit by 25 members, at the BAFFA Art Gallery, 47 Gillette Avenue, Sayville, New York. The 10th Annual Student Scholarship Fundraiser and Artist Reception will be held on Saturday, February 2nd, from 3 to 6 PM. Raffle tickets for original artwork and gifts, generously donated by our artists and local merchants will be available to support the fundraiser. The reception is free and open to the public. The exhibit will run in the BAFFA (Bay Area Friends of the Fine Arts) Gallery, located in the historic Gillette House, from February 1 through February 24, 2019. The Gallery is open on Tuesday, Thursday and Friday from 10 AM to 1 PM and Saturday and Sunday from noon to 4 PM. For additional information: www.womensharingart.org, 516-840-3255, or www.baffa.org, 631-589-7343.